I put a lot of links to vinyl resources on "The Vinyl.start.be" site. All you want to know about Belgian radio - Thanks To Rudy Gijbels! Azing Moltmaker from Holland opened a Beatles Museum in Alkmaar - The Netherlands. Nederlandstalige Nieuwssite over de (solo)Beatles op internet. 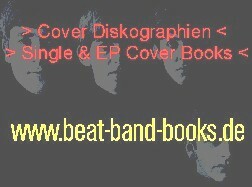 Specializing in rare original Beatles and Rock 'n' Roll vinyl! Illustrated discography from the U.K.
A website dedicated to the Beatles album HELP! Online shop for records, memorabilia, books, autographs and other items. Musings, Memories, and Minutia on "Beatlesmania"
The Rolling Stones discography on 7"
Illustrated discography with many picture sleeves of the Rolling Stones Albums. Joe Giorgianni's The Who page. Lots of information about The Who and rare records from all over the world. White Fang's The Who site. Visit his discography with all the pictures of The Who recordsleeves. Great Album Covers discusses the album cover art found on vinyl record album covers and the album cover designers who created these great album covers. Largest records fair in the world. Heinz Dietz wrote some fabulous books about 60's Beat Bands. Pink Floyd's Illustrated discography from more than 60 countries. Much information for The Byrds fan with many pictures of their records. Picture sleeves of The Sweet from many different countries. Bob Dylan's Officially Released Rarities and Obscurities. A must for the Bob Dylan fans. Discography from the Kinks with many pictures of European pressings. Great illustrated discography from Genesis. Rare recordings and pressings from Genesis. Great illustrated discography from The Doors. Especially for those who are interested in Belgian Pop and Rock from the past till now. Website dedicated on Psychedelic Albums and cover art. Dutch resellers webpage with a picture sample of each selling record. Rare 45's and LP's for sale - very professional site recommended!!! One of the UK Top Suppliers of Northern Soul, Mod and Ska 45s Lps and memorbilia. Here you'll find the best reviews for music instruments, record players, audio etc.